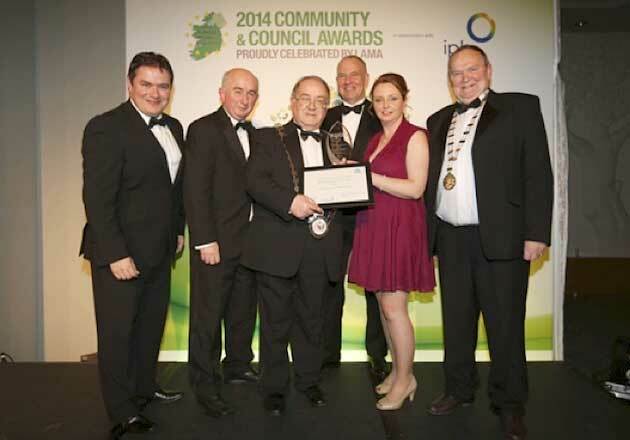 The Cox’s Demesne Regeneration Project managed and delivered by Bayview Contracts which provided major energy efficiency works in 573 homes in Dundalk has been awarded the “Best Energy Smart Initiative by a Local Authority” at the 2014 Local Authority Members Association (LAMA) Awards. The first phase of the regeneration project saw Dundalk Town Council take on Ireland’s biggest energy efficiency retrofit to date. As a partnership project involving Electric Ireland, Sustainable Energy Authority of Ireland (SEAI), Dundalk Town Council and Bayview Contracts, €3.3m was invested in energy efficient insulation, boiler installations, draught proofing and the installation of heating controls in the Cox’s Demesne houses. All this work was carried out free of charge to the residents concerned. The second phase of the Regeneration Scheme now consists of the Ashling Park pilot project, which is looking at improving existing council housing stock as well as the local physical environment. The Cox’s Demesne project will now proceed to the prestigious European Finale of the Ace Awards in the Netherlands in autumn. Edel Giltenane, Ace Executive Project Manager at awards sponsor Codema, said Cox’s Demesne Regeneration Project was selected for its creative approach and its potential as an exemplar project that can be replicated successfully by local authorities across Europe. Cox’s Demesne Regeneration Project will now join the winners of preliminary rounds in Belgium, France, the Netherlands and the UK at the finale of the Ace Awards. The award for Best Energy Smart Initiative was presented at a special Community and Council Awards night held by LAMA in the Crowne Plaza, Santry and was hosted by RTÉ presenter Miriam O’Callaghan. Dave Storey, Senior Executive Officer, Dundalk Town Council said it was heartening to see recognition for Dundalk’s involvement in a pioneering project. “A retrofit on this scale had never been carried out in the country until Dundalk Town Council put the wheels in motion and we knew that other authorities around the country were looking on our project as a national pilot scheme. Two thousand people have benefitted from the €3.3m energy efficient retrofit project after work was carried out on their homes to reduce energy consumption. Barry Cunningham, Managing Director of Bayview Contracts stated “Bayview Contracts are delighted to be involved in such a groundbreaking and innovative project. This project has been a huge success and this community based approach will undoubtedly shape the future of home energy upgrades within Ireland and indeed Europe as a whole”.